Many editors work on multiple projects concurrently, but need different datasets for each project. 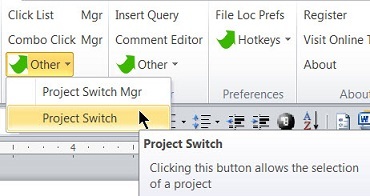 The purpose of Project Switch is to make moving between projects easy. A single file (#A) can contain multiple configurations (#1). Configurations can be added to a file as well as renamed (#B). The Macro column (#2) lists those macros that have project-specific characteristics. The Sub Tab (#3) indicates which tab of the macro is being made a part of the configuration. For example, it is the Project Specific tab of the Insert Query macro that is being configured (#C), not any of the other tabs found in Insert Query. 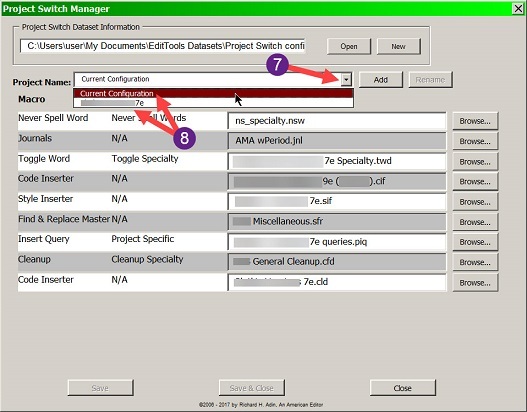 The filename column (#4) identifies the specific file chosen to be active in this configuration. Browsing (#5) enables a search for the correct file. Once it has been configured, Click either Save or Save & Close (#6). 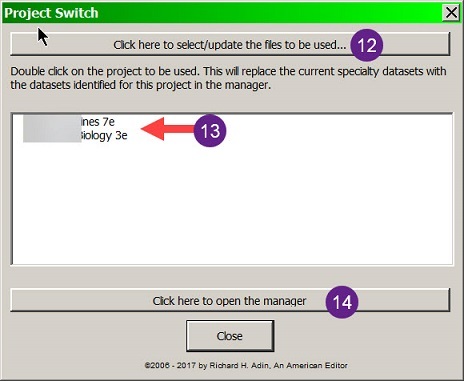 Clicking on the dropdown arrow (#7 below) will display all of the configurations in the open Project Switch file (#8). Choosing a configuration (Project Name; #9 below) shows the choices that will be loaded. For an example, compare numbers 10 and 11 below with their counterparts above. As many preconfigurations as wanted can be made and saved. Once that is done, you can use the macro to select the configuration to load. Here you can choose which configurations you want to appear in the main screen. Once you have selected the configurations, there is no need to return to this dialog unless you want to make a change. Clicking OK returns you to the main dialog. The chosen configurations appear in the main screen (#13 above). Double-click on the configuration you want to load. If you need to create or correct a configuration, clicking on button at #14 will open the Manager. 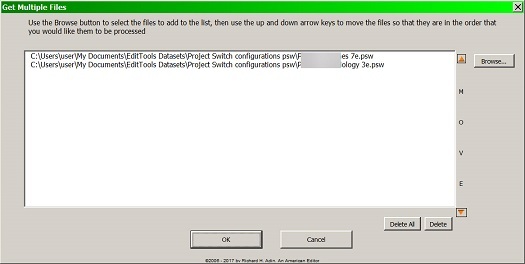 Project Switch provides an easy way to configure macros for specific projects without having to repeatedly change the configurations one-by-one as you run a macro.